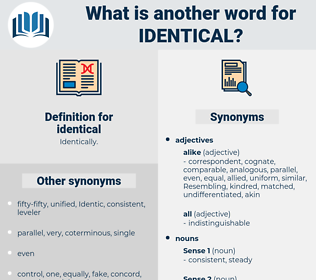 What is another word for identical? 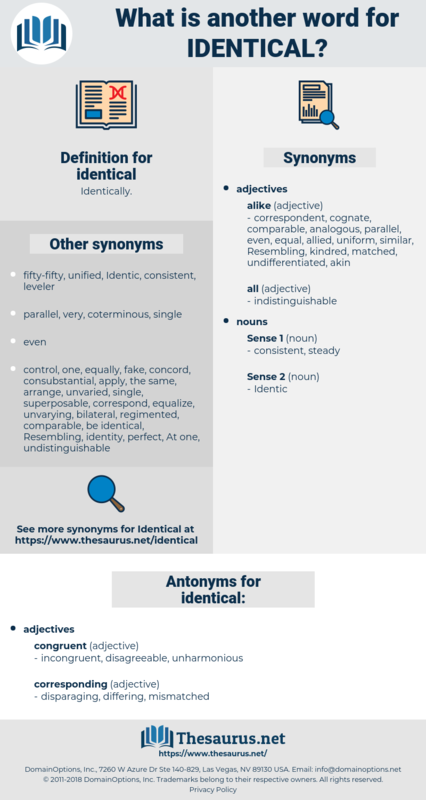 consistent, comparable, analogous, unchanged, coincident, exactly, different, corresponding, uniform, concerted, compatible, exact, twin, unanimous, replicate. variable, not alike, unmatched, varying. inaccurate, inexact, incorrect, indefinite, approximate, imprecise. distinct, different, diverse, opposite, dissimilar, unequal, unlike. biovular, anisotropic, differentiable, discriminable, another, sundry, nonidentical. The interest which I had felt when I thought the two identical was a false interest. Looking for some explanation of this unwonted traffic in a country village, Kitty noticed an auctioneer's bill pasted on a board beside the open gate, setting forth particulars of a sale of household furniture and other effects, which was apparently taking place on that identical day.